Considered at the time to be a “war to end all wars,” the First World War (1914-1918) left lasting scars on the people and places engulfed in the conflict. Marking the centenary of the Armistice on November 11th1918, An Indelible Mark: British Art of the First World War, curated by PhD candidate Judith Stapleton, traces the visual legacies of the conflict. Featuring objects drawn from the Yale Center for British Art’s Prints & Drawings and Rare Books & Manuscripts collections, the exhibition incorporates images made both at home and on the front. 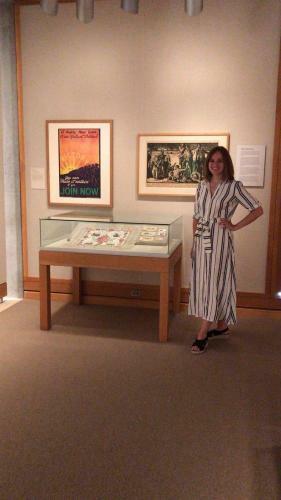 Highlights include works by acclaimed war artists C.R.W Nevinson, James McBey, Gerald Spencer Pryse, and Frank Brangwyn, which are displayed alongside propaganda posters, textiles, and memorabilia made by unnamed artists. These evocative works highlight the war’s innovations—from print technologies to field artillery—as well as its devastations, illustrating the unprecedented damage the First World War wrought on landscapes and human bodies alike. One hundred years on, the issues raised by these works continue to resonate; far from ending all wars, the “Great War’s” legacy remains current at a time of continuing modern conflict.